For the second year in a row the NBC family drama “This is Us” is the top nominee at the Gold Derby TV Awards with nine bids. It’s followed closely by two programs tied with eight noms apiece: fellow drama “The Handmaid’s Tale” and the limited series “The Assassination of Gianni Versace.” Meanwhile, “Atlanta” and “The Good Place” are tied as the top comedy contenders with seven nominations each. Scroll down to see the full list of contenders for these 15th annual awards. Over 1,000 Gold Derby users voted for their television favorites over the last month. Our editors announced this year’s nominees live on Thursday, July 26. Watch the complete video of the announcement above. Scroll to the bottom of this page for instructions on how you can vote for winners in all 30 categories throughout the next few weeks. The nine nominations for “This is Us” are the same number the show received last year, but with a few differences. 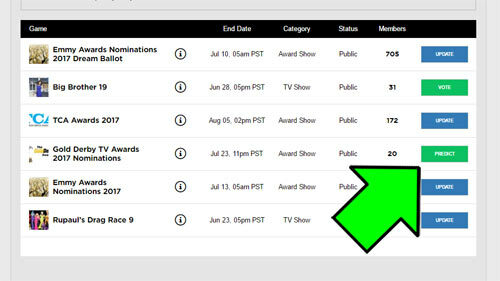 The show is back in the races for Best Drama Series, Best Drama Actor (defending champ Sterling K. Brown), Best Drama Guest Actor (defending champ Gerald McRaney) Best Drama Episode (this year for “Super Bowl Sunday”) and Ensemble of the Year, where it competed last year. But it also picked up first-time lead-acting noms for Milo Ventimiglia and Mandy Moore, a first-time supporting nom for Justin Hartley, and Ron Cephas Jones moved from the supporting race to the guest race this year. Alas, there’s one notable absence: Chrissy Metz missed the cut for Best Drama Supporting Actress after earning a nom last year. But while “This is Us” hold steady, “The Handmaid’s Tale” more than doubled its nominations, up from three last year to eight this year. It’s back in the race for Best Drama Series. And Elisabeth Moss hopes to defend her title after winning Best Drama Actress last year. Meanwhile, Ann Dowd and Yvonne Strahovski earned their first nominations for their supporting performances while Samira Wiley and Marisa Tomei are contenders as guests. Rounding out the Best Drama Series race are “The Americans” (five nominations) “The Crown” (five nominations), “Game of Thrones” (seven nominations) “Killing Eve” (three nominations) and “Stranger Things” (five nominations). Two of those are actually defending champs: “Thrones” won in 2015 and 2016, but then “Stranger Things” prevailed in 2017 when “Thrones” was on hiatus. “Gianni Versace” swept the longform categories with eight noms including bids for Best Limited Series, Ensemble of the Year, and for six performances: Darren Criss for his starring role, and Judith Light, Penelope Cruz, Edgar Ramirez, Cody Fern and Finn Wittrock for their supporting turns. The true crime drama is joined in the Limited Series race by “American Horror Story: Cult” (three nominations), “American Vandal” (two nominations), “Godless” (four nominations) and “Twin Peaks” (four nominations). Like “The Handmaid’s Tale,” sophomore comedy “Atlanta” is also up significantly this year, improving from four nominations to seven. It’s back in the running for Best Comedy Series, Best Comedy Actor (defending champ Donald Glover) and Best Comedy Supporting Actor (Brian Tyree Henry). But this time Lakeith Stanfield joins Henry in the supporting category, and the show has two nominations for Best Comedy Episode instead of just one (“Barbershop” and “Teddy Perkins”). Besides “Atlanta” the only other returning nominee in the Comedy Series lineup from last year is “Unbreakable Kimmy Schmidt” (three nominations). They’re joined by three first-year shows: “Barry” (four nominations), “GLOW” (five nominations) and “The Marvelous Mrs. Maisel” (five nominations). The aforementioned “Good Place” is a second-year show, which has exploded to seven nominations up from just one last year. And there’s one revival in the mix too: “Will and Grace” (six nominations). But none of this year’s Comedy Series nominees has ever won before, so we’re guaranteed a new winner. You can start voting right now for the winners by following the instructions at the bottom of this post. What do you think of the contenders? Sound off in our comments, and join the discussion on this and more with your fellow TV fans in our forums. 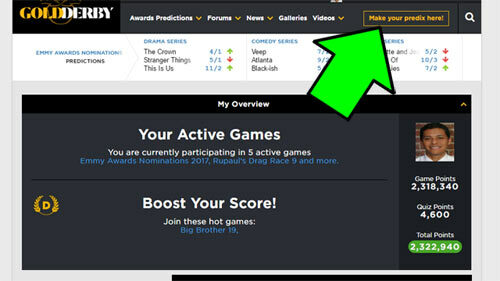 1) Click “Make your predictions!” at the top of the Gold Derby page. 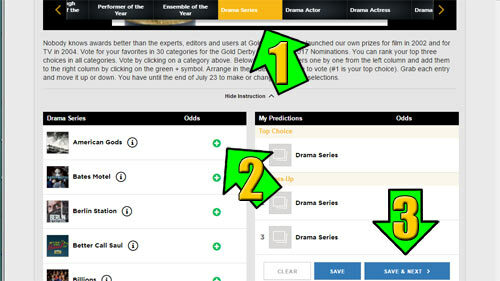 3) Select a category, add your favorite candidate from the left column to the right column, and save your top choice. This is a plurality vote, so just pick one nominee as your favorite. The nominee with the most votes wins.